My old dear acting coach, Sandy Meisner, used to say that we must adjust to the given circumstances in order to be successful actors. If, in an improvisation, your acting partner says that you are a locomotive, the very best response is chug-a-chug-a-choo-choo. If in life, someone hands you a bag of lemons, adjust to what you are given, and make that lemonade, bunky, and throw a party. This ability to adjust will serve you well in your travels. Ive always felt that the journey, along with the people you meet, are the true adventure when traveling, a heck of a lot more for me than the holiday resort destination where we all cower behind those sturdy compound walls and the only locals you meet are the drug dealers and the sister sellers shouting to you over that wall. Most folks like to lock in their reservations for the places theyd like to stay, especially while traveling in a foreign country, for fear theyll be left out in the cold and dark with no place to go if they havent booked a place ahead of time. Well folks, I have found in most tropical countries, this predicament will simply not happen. Bahamian people for example are so damned friendly and open, theyll go out of their way to point you in the direction of all your desires, starting with, in most cases, a cozy and inviting guest cottage in back of Aunt Madelines house right on the beach, away from everybody, and normally at one third of the price you pay at a resort hotel. Thats not too much to ask of Fortuna, the Goddess of Travelers. Especially if youve been a good person lately. Have you been a good person lately? So, heres how you go about planning your very own Air Only expedition. Book tickets to someplace exotic in the world youve always wanted to go. Pack your ticket in your passport along with your drivers license and a Visa card and some American dollars. Pack your bag very lightly (Ive learned the hard way). Wear your nice outfit for traveling and clearing customs, and pack an alternate outfit for hiking and swimming, one good book, a little radio, plastic rain poncho in a sack for the bottom of your bag, and a tooth brush. The trick is to travel light and quick as you can, on and off the planes, so you dont have to wait for baggage at the airport carousel. This way you can clear customs quickly and politely and head directly for the taxi stand. Now youre first in line. You get your choice of taxi men. Theyll all come up and hit on you. Taxi Sir? Taxi Sir? Heres what you do. Take your time. Choose carefully. Find the taxi man who is friendly, intelligent and closest to your age and generation. Dont panic. Be patient. Just smile and listen, and find the guy you like. Hes your passport to your dream vacation requirements. Taxi man knows where everything is on the island so when youre in the taxi sit up front with him and strike up a conversation. When he asks you Where to! tell him that youre used to staying at a nice hotel, then name a hotel if you know one on the island. 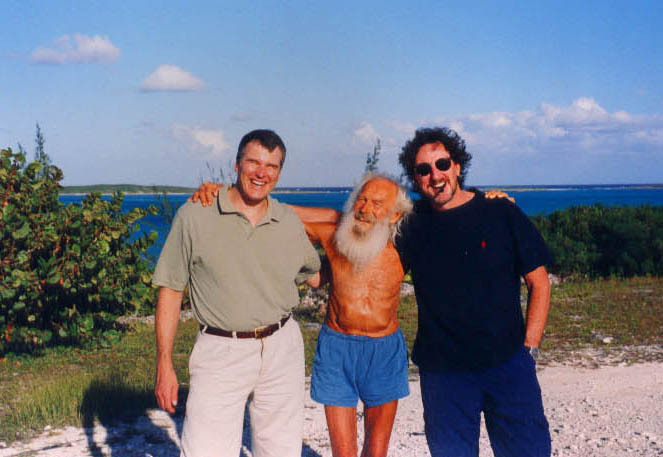 In our case it was the Peace and Plenty Hotel in Georgetown on the island of Great Exuma. 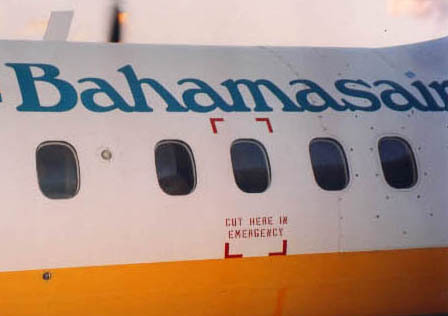 But this time tell him youre having your doubts about staying there, because you think its too damned expensive, and you fear youre not going to get to know any of the local island folk, because thats why you came, to jump up with the local gang (which is party down dude in Bahamian). Its truly amazing how quickly the taxi man comes up with a myriad of alternatives for your humble consideration. Thats how we met taxi man Kermit Rolle at the Exuma Airport in Georgetown. Wed mentioned the Peace and Plenty Hotel to him, a well-reputed high-end sailor and sport fishermans haven with great food and rooms ashore for the sea going yaughtsman, but I bemoaned the fact that we would probably miss the villages and backroads if we stayed in the big town. In an instant Kermit suggested we come and stay at his family villa, unused except for an evangelistic caretaker, and would we please use the hilltop sanctuary overlooking the sea as a base for our hiking forays into the local jungle and oceanside trails. This good fortune happens to us Air Only adventurers far too often to be coincidence. The taxi man can make it happen for you, so choose carefully at the airport, find a taxi man you like and youll enjoy your stay. Taxi man will show you where the shops are, hell introduce you to the fruit and veggie man, the fisherman who catches the grouper and lobster for your dining pleasure, and even the Rasta man, if youre that way inclined. Owning a taxi van on the islands is a sign of a successful man, a man with authority and responsibility who commands respect among the people. The taxi man makes people and equipment move from place to place, cheaply and quickly. Hell get the doctor if youre ill, hell drop off a bottle of rum and stay for a drink to see how youre doing, hell make suggestions for restaurants and jump-up parties around the island, and hell make sure you and your luggage get back to the airport sober and ready for your plane ride home. The taxi man in Bahamas is your friend. Hell help make your Air Only adventure a success. Running down the southwest Florida coast past Fort Myers beaches and Sanibel and Marcos Islands, past Naples is the Tamiani Trail, Hiway 41. Then as if Tamiani can no longer abide the sun and salt spray of the Gulf of Mexico, it charges headlong east into the Everglades, the old Alligator Alley, long and straight, through the Giant Cypress Reserve, pausing for only a moment at the Gates of the Everglades National Park in Everglades City where the rainforest jungle says howdy to the gentle breezes of the Gulf. Ten thousand islands, a refuge teeming with endangered wildlife, Bottle Nose Dolphin, the Manatee, and the Florida Panther, living in the hardwood hammocks, mounding up out of the flat swampy brown and gold of the ever dangerous Glades. There are no hiking trails as such in Everglades City - but one hell of a boat ride cruising the 10,000 Gulf Islands. But just beyond is the Oasis Wildlife Center. Hike the north trail between the canal and the airstrip. Its like hiking in Holland only wetter. The flat, grassy path just disappears into the swamp at times making for squishy boots. So head on up to Monroe Fla. and hike the Loop Road south following a gator canal with enough large and violent splashes to keep you on your toes. 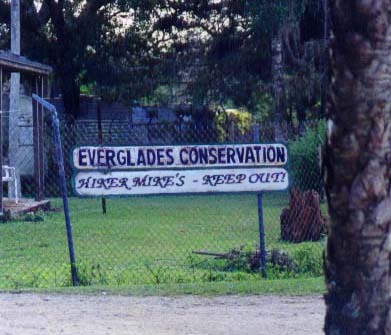 Park your car at the Everglades Sportsmans Club. Theyll guard it for you. Hike just 5 miles south of the club and a crystal spring and waterfall come up to the road to meet you. So what you do is shout real loud to scare off the gators, take off your hot and sweaty clothes and ease your way in up to your neck and cool your jets, but keep your feet under you just in case you gotta jump out fast. 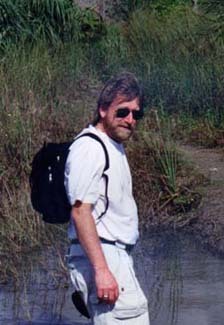 Wed been hiking all over the Glades for 4 arduous days but the whole campaign turned on that swim. The mission was accomplished - the mandate satisfied. So now we could come home, tell the story and sing the song. We are stardust hikers, we are golden. Now we gotta get back to the Summerhill Gardens. Hiker Mike over and out. Just 30 miles east of Naples, Florida, down the Tamiani Trail we now call Hiway 41 is the Collier-Seminole State Park - a 6000 acre mangrove preserve that is home to the endangered American Crocodile, black bears, panthers, bob cats, and in its waters what few manatees remain here on earth. Boater Beware signs everywhere.The ecosystems diversity consists of tidal creeks, mud flats, cypress swamps, and majestic pine Savannah. And all of these wonders of nature can be accessed by a 6.5 mile wilderness hiking trail through this jungle, and a 13 mile canoe trail along its canals and waterways. 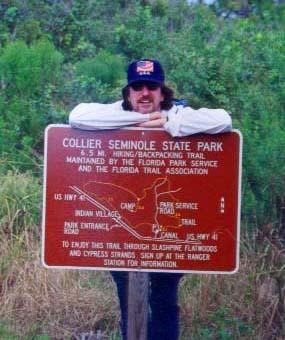 After checking in with the visitors center, and filling out a hiker file, absolving the state of Florida of any responsibility for our actions, the State Trooper known as Smokie gave us a trail map and an update of trail conditions, and into the park we went. We found the trail loop pretty wet, and since Smokie warned us about the gators and snakes, we decided to hike the 4 mile fine road instead which took us through the Great Cypress Forest and across the pine Savannah flatlands which are cleared by fire every 3 years to encourage tree growth, so most of the surviving trees are marked by black char 5 or 6 feet up the tree bark. Lots of big animal tracks on the road, so unless youve done primitive hiking before, be prepared for wild life and that feeling of imminent danger. Collier Seminole Wildlife Refuge will focus your instincts, and is careful not to disturb the natural ecology or the Seminole Indian Tribe whose village lies at its center. The hike finished at noon, and we drove the 10 miles to Marco Island for a lunch of oysters and conch chowder at the Snook Inn, dining al fresco to the soothing sounds of the Gulf of Mexico. Then off to hike the best kept beach hike secret on Marco Island - the Tiger Tail - 8 miles of virgin white sand bar cutting out into the gulf. We walked for hours on the hard packed sand just above the waterline and watched a million hungry birds hunting for dinner. Today we head for the Everglades National Park for more jungle adventure, which Ill tell you all about next week. Hiker Mike and Dave Bradstreet reporting from the beautiful SW coast of Florida. Pulling into the almost 2000 foot high parking lot of the Grand Etange National Rainforest surrounding the volcano at the top of Grenada, we were met with a bevy of screams from the jungle. Screams are not uncommon here as the revolutionary government took up refuge in the Visitors Center during the Reagan raids on the Island in 1983, but this time they were coming from the treetops where an entire family of Mona Monkeys sat screaming for bananas, which our trail guide Mandoo had in his backpack, for the kids to pass on. And so began our ascent of Mt. Qua Qua, a razor back ridge hike to the top of Grenada. The trailhead was wide and paved with nutmeg shells crackling underfoot, but soon turned into a foot wide mud slide climbing almost vertically through the rainy forest with the Crater Lake falling away one side and the town of St. Georges far off on the other. The trail is dangerous without a Moses walking stick or third leg. There are, however, tree root footholds in the mud. High top boots with a winter tire grip are a must. Long slim blades of razor grass line the trail. I grabbed some of it while sliding headlong down the trail and four weeks later I still have the deep slices across my fingers, which could have used a dozen stitches to put right. So hiker beware. QuaQua is either a vertical climb or a mud bath to the knees, but the workout is astonishing, and I counted my heartbeat at over 200 beats per second. The benefits of rainforest hiking are a cooling wind and absolutely no bugs and the greenery scenery will take your breath away. Lots of fern and pines, big old mahogany trees with Tarzan like vines and the biggest fattest bamboo forests this side of Vietnam. After reaching the big rock at the top of Mt. QuaQua, your body will feel like superman as you descend the 1000 feet into the oxygen. There are many hikes from the Visitors Center. So take your kids and Grammas and they can do the Crater Lake and Lookout hikes, and feed the monkeys, who I now find out were not screaming for bananas when we arrived, but laughing in mock derision when they found out I was about to climb Mt. 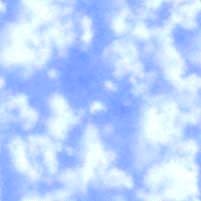 QuaQua.